So here Peter saves his harshest words for those who at one time walked in the faith and now have turned their back on Jesus. It seems that he is pointing out specifically people who have turned their back on the Word in order to gain physical pleasures. As you read through this chapter I hope you hear the strong emotions that ought to be coming through. Let's set the context a little bit. Peter was living in an era where if you believed in Jesus and admitted it, then your life was at stake. He had personally witnessed a number of disciples and apostles martyred because of their faith. He himself will be martyred. As tradition has it he will be hung upside down on a cross because he did not feel worthy enough to be hung on a cross in the same way that his Savior was hung. 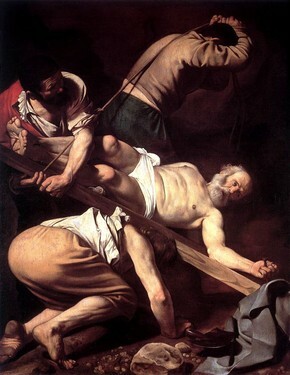 Here is a painting by my favor artist to depict Peter's martyrdom. So, I think we can understand why Peter felt so strongly about this. He does not mince words and here we have the most clear description of hell that we find pretty much anywhere in Scripture. For today there is an equal anger in my heart for those who would claim to be disciples of Jesus Christ and yet lift up causes that simply go antithetical to Jesus' message of love and mercy. Yes, we have the judgment of God and it is clear that it is coming, but no where in Scripture do we read about that judgment coming at our hands. It is God who judges and only God who can decide and declare who is guilty. It is a harsh chapter but one we should read with an eye to identifying those times that we say we represent Jesus but we really in fact just represent ourselves.